bl.uk > Online Gallery Home	> Online exhibitions	> Asia, Pacific and Africa Collections	> Dwellings in Rural Bengal. 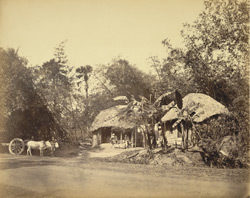 Photograph taken by Joseph Lawton Saché of scenery in a village at an unidentified location in Bengal, from a collection of nine prints which belonged to Stanley Leighton MP. Sache photographed a number of scenes which had already been taken by Samuel Bourne, suggesting a deliberate attempt to recreate these views. Much of India's populace is rural and the simple vernacular buildings which form their dwellings have remained largely unchanged for centuries. The onslaught of concrete has begun to have an impact on the scenery, and thatch is not as favoured a medium of roofing in present-day India. However, it was these humble square or rectangular single-storeyed mud or brick houses with their over-arching roofs and shaded verandahs on all sides which led to the development of the bungalow (the name derived from 'bangla' in Bengali) as a favoured building style for Europeans in India.